Benedict Funeral Directors are undertakers serving North Hertfordshire and Bedfordshire. Being an independent, family run undertakers brings certain advantages with it; namely you are assured of our personal touch, total respect, honesty and compassion. When arranging a funeral, part of that respect is to let you know your options. Funerals are one-off events and they can be relatively simple or very extravagant. No-one wants to deal with an undertaker who is only interested in sales and that is why our promise to you is one of honesty. We are experienced funeral directors, sensitive to your needs at a difficult time; we will tell you the truth about what your options are. Be assured that no matter what you choose, be it simple or extravagant, our respect to you and your loved one will not change. It is what makes us who we are. Our Funeral Homes are in Arlesey and Houghton Regis. From these two funeral homes we are conveniently placed to serve Stotfold, Baldock, Letchworth, Hitchin, Stevenage, Luton, Dunstable and the surrounding area. We also have a florists, called Flowers for All Occasions, attached to our funeral home in Houghton Regis. Need help today? Read more about funeral arrangements and how we help you. Or call us on the numbers below. A first class undertaking service at a highly competitive price. Please see our Introductory Video and our Testimonials. 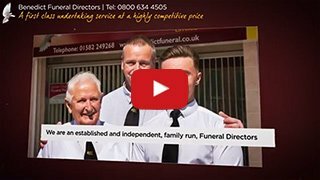 Thinking of Pre Paying for a Funeral? See our Pre Paid Funeral Plans.